And I created instance of Product class in usual way setting values for both properties. I had put all images in ProductImages folder. 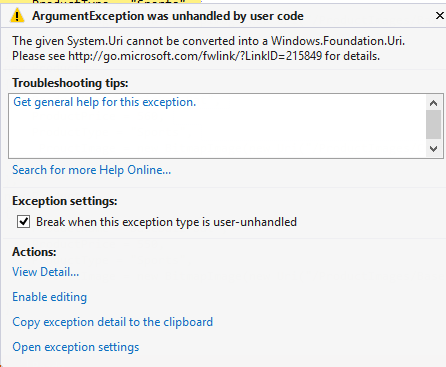 On running application I got following exception that given System.Uri cannot be converted. After small research I found that WinRT does not support Relative URI. It only supports Absolute URI. Now I fixed above problem by converting Relative URI to Absolute URI. Exception got fixed after changing URI as absolute URI. I hope you find this quick fix useful. Thanks for reading.